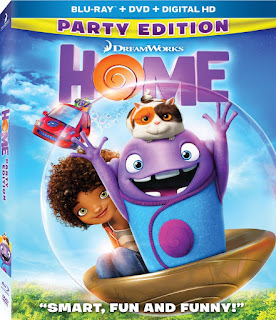 When a misfit alien named Oh (voiced by Jim Parsons) crash lands on Earth, he forms an unlikely friendship with Tip (voiced by Rihanna), an adventurous but untrusting girl. Together they form an odd couple friendship and embark on a global road trip while on the run from Oh's own alien species. Their wild trip and growing bond of friendship plays a vital role in intergalactic relations. I absolutely love this movie that will interest children and adults. It is cute, hilarious and very well done. I think this is one that children will watch again and again in the future. I think this is a fantastic movie to give as a Christmas gift. You can now purchase this movie in stores and online.